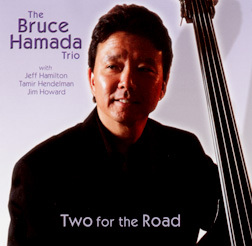 Time was when Bruce Hamada was best known as Loretta Ables' bass player at the Halekulani, but in recent years he's established himself as a vocalist as well, and a guy who is as comfortable in a recording studio as he is headlining Lewers Lounge with pianist Jim Howard. Hamada co-produced his latest project with island jazz maven Don Gordon and they've created one of the best jazz albums to come out of Hawaii in recent years. True, there isn't a lot of jazz recorded here. Even so, "Two For The Road" is better than some that have won Hoku Awards in the years past. Hamada opens strong with a swinging acoustic arrangement of "Learnin' The Blues" that introduces the project perfectly. He sounds almost too cheerful as he sings about the wretchedness of heartbreak, but oddly enough that adds to the impact of the song. There's no question by the time its over that his partners, Tamir Hendelman (piano) and Jeff Hamilton (drums), are assets as well. Hamada steps forward instrumentally with a solid acoustic solo on "Have You Met Miss Jones." He opens a lesser known tune, "The Bop Be Pops/FJR," with another beautifully realized extended solo on an original arrangement that gives the other guys plenty of space to solo as well. Other highlights include Jim Howard taking over the piano on "You'd Be So Nice To Come Home To," Hamada's take on the album-closing title track, and the concise liner notes in which he shares the personal significance of each selection. iNoA'ole is a Jawaiian bar band that also plays contemporary "urban" music, an assortment of oldies, and an occasional original. That makes them a great choice as the live entertainment at a baby luau or graduation party but much less interesting as recording artists for anyone familiar with the original versions of "I Shot the Sheriff," "Play That Funky Music" and "Nights Like This." Synthizers are an understandable cost-cutting expedient for a bar band, but who really wants to hear Earth Wind & Fire songs redone without a real horn section? On the other hand, give them credit for imagining the Toyes' classic substance abuse anthem, "Smoke Two Joints," as a medley incorporating the Luniz' 1995 hit, "I Got 5 On It," even though they forgot to acknowledge the latter group in the composers' credits. It's a fine piece of dance club music anyway. The most impressive thing about the album is that they recorded it straight through in one marathon take -- a "live" album" in the best sense of the word. Wanna know what iNoA'oLe can do at your next party? This is it, an "artist's demo" that's good enough for play on Hawaii's self-styled "island music" radio stations. 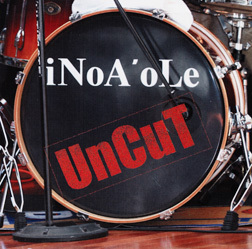 In short, "UnCuT' would be a great memento of a night in a local bar when they're playing. Don't forget to have them sign it. "Master If The Steel Guitar, Vol. One"
The death of an iconic recording artist invariably rekindles interest in their vintage recordings. 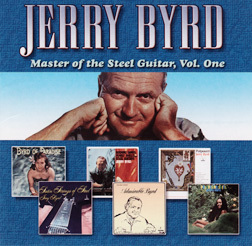 That's the case here as Michael Cord and Harry B. Soria Jr. offer this retrospective on the life and music of steel guitar master Jerry Byrd. Byrd, who died earlier this year, was a major figure in the history of the instrument. That makes this anthology of recordings he made in the early 1960s of interest even though a majority of the melodies are not Hawaiian. It's impossible to pick favorites. Byrd's arrangements of "Hawaiian Wedding Song" and "Beautiful Kahana," display his feel for Hawaiian melodies, but his recordings of mainstream pop tunes stand as reminders that the steel guitar need not be considered a niche instrument restricted to Country and some genres of Hawaiian music. The songs Byrd wrote -- "Bird of Paradise" and "Steelin' The Chimes," to name two -- are equally important in showing that he was a talented composer as well as a great technician. Soria's detailed biography completes this excellent anthology with a comprehensive account of Byrd's contributions to 20th-century music.